Shutdown Windows Explorer: you have to get to the logoff screen then press Ctrl + Alt + Shift and simultaneously Cancel, that will close Windows Explorer without ending the session. That helped me a lot when some Windows Explorer window goes crazy and doesn't want to respond. I think this has worked since Windows 95, but I'm not sure. Edit: I guess they are documented somewhere official after all. Bring Misplaced Off-Screen Windows Back to Your Desktop is a classic in this time of "double screen programming", especially when you must access your double-screen computer from a one screen remote desktop. The application is running. You can see it in the taskbar, but you can't see it on the screen, because it still thinks it's running on the secondary monitor. You try and use right-click, Move, but that doesn't do anything, and the window doesn't move anywhere. You end up rebooting and cursing Microsoft. There's a simple trick to get around this. First make sure you've alt-tabbed to the window, or clicked on it once to bring it into focus. 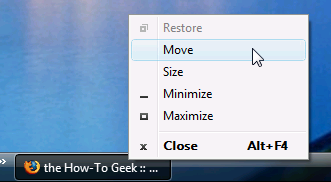 At this point, you should notice that your cursor changes to the "Move" cursor, but you still can't move anything. Just hit any one of the arrow keys (Left, Right, Down, Up), move your mouse, and the window should magically "pop" back onto the screen. Using Check Boxes to select multiple items within Windows Explorer. This is really useful if you want to use single-click navigation rather than double click in Windows Explorer. For shutting down my machine I use Start , U , U. It depends on if you have anything that starts with U in your start menu or not, the above is for if you don't. The last U can be changed to either R or S.
Otherwise, I love altshiftesc, StartD, StartR and the like. I'm truly amazed by how many people CANNOT REMEMBER alttab no matter how many times a year you tell them. The problem seems to be in holding alt down to tab through the apps. I recently took the time to learn these keyboard shortcuts - pretty good when I am editing some text. Of course these shortcuts have been around for a long time. In conjunction with Alt+Tab or Win+Tab, it just can come in handy when you are editing some text and don't want to take your keys off the keyboard. 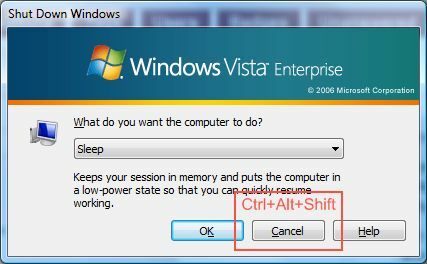 Since Windows XP, if I recall, Ctrl + Shift + Esc will bring up the task manager, even when it would normally bring up the dialog asking if you want to log off. Why can't I log into my Server 2008 machine? Windows Server 2008 Keyb/Mouse non-responsive at Login Screen? How can I automate creation of GPO shutdown script? Ctrl + Alt + Del prior to Windows 10 logon no longer needed?